Have you ever volunteered for something and come away feeling used? Or have you felt burnt out working for someone because you did not feel appreciated? Whether you are a volunteer or a staff member, feeling valued in tangible ways by the leader makes all of the difference. An easy work load or a tough one really do not make the difference so much as the atmosphere in which you serve. And, yes, even as an employee you are serving your boss. Emplyees volunteer to work for their boss. If you have a high turn over rate in volunteers or employees, ask yourself whether or not they are feeling valued. Do you have exit conversations or interview with people who are leaving to ask them why, or do you let the door hit them on the way out? If you do not know specifically why people are leaving, you cannot improve your chances of keeping the people you have. 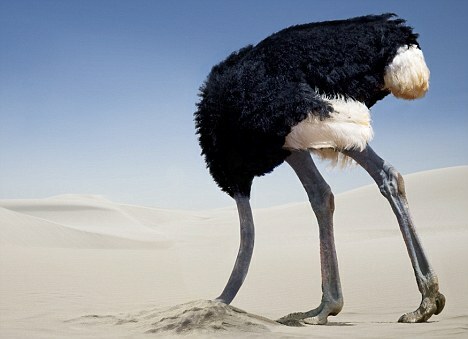 You’re sticking your head in the sand. Like an ostrich. Recently I noticed that a choir member was no longer coming to rehearsal and singing. Because I am in a retiree area, having people miss from time to time is not unusual, so it was not until after a few weeks that I called and left a message for this person asking if everything was ok. Note: do not ask if everything is ok unless you want to hear the answer. I got a detailed email back outlining not only the crazy life things they were dealing but also the issues they had with the way I direct the choir. Their tone was not mean, just honest. I sent a note back genuinely thanking them for their response, I told them I would be praying for them, and then I told them what I learned from their email. I did not guarantee I would do everything as they liked; I just said (honestly) that I was going to try to learn from their poor experience. In response this person said they may come back, and they appreciated my inquiry. I wish all of my interactions went this well. I do not know if this person will actually come back, but I have repaired a bridge I did not know was broken. Here are a few suggestions for making volunteers (and staff) feel valued. 1. Ask them how they are doing, about their family, about their hobbies, and then listen. Just asking = no kudos. Asking and paying attention = major kudos. 2. Ask people who have quit why they are quitting, and then listen. The people who still volunteer for you will see this as maturity and a willingness to grow and will respect you. 3. Cancel staff meeting or rehearsal and take them someplace fun. At one church the senior pastor bought us all tickets to the minor league team in town and we skipped staff meeting that week. Talk about a morale booster! 4. If a volunteer or staff member mentions a struggle, pray with them right then and there. Being a spiritual leader has very little to do with words and everything to do with actions. 5. Follow up with them on prayer requests and concerns they have shared. If a volunteer or staff member mentions a struggle and you pray with them, they are appreciative. If you follow up with them a few days or week later, they begin to feel valued and safe. 6. Be straight up. In my last interim position, I felt a little like Wesley in The Princess Bride. “Good night, Wesley. I’ll most likely kill you in the morning.” The pastors said very clearly they were looking for a younger person and a guitarist to be their music pastor, both of which I was not. Every week they would say, “We love what you’re doing, and here is where we are in the search for the right person.” Oddly enough, I felt very secure because I knew exactly where I stood with them. Ultimately they adjusted their view and I got the job, but that is another story. 7. Ask their opinion, and then incorporate their advice. If you always dictate what should happen and never ask for their input, volunteers and staff will feel unneeded. People want to be needed, and you should be humble enough to know that you need them. 8. Don’t rush. The “Putting Out Fires” syndrome is one of the biggest diseases in church. Leaders think that they are saving their church when they run around putting out fires, when often really all they are doing is servicing the tantrums of children. When pastors service the urgent “fires” first, they neglect the important work of spending significant time with their staff and volunteers. Rarely are urgent and important the same thing. The only “fires” that are truly “fires worth putting out immediately” are serious illness, actual fires, public sin, and aggressive malicious behavior. “I don’t like the music,” or “Brother Jerry hurt my feelings 10 years ago when he stopped wearing a tie,” are not fires. How do you tangibly value your volunteers? This entry was posted in Church, Leadership and tagged burnout, choir member, conversations, crazy life, head in the sand, high turnover rate, leadership, ostrich, poor experience, putting out fires, rehearsal, staff, staff member, The Princess Bride, volunteer, Wesley, worship leadership by Maurice F. Overholt. Bookmark the permalink.